During the following years, the company expanded, developing two further ranges of collectable ceramics, The Heritage Collection depicting well known or interesting London Buildings, and the Beside the Sea range, a collection of delightful seaside buildings that evoke those childhood holiday memories. As the company grew Hazle selected and employed a band of talented artists, some of whom you will still meet in our workshop today. 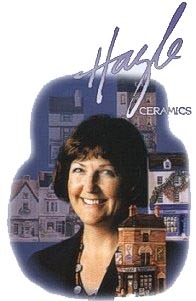 Hazle, as an ex-teacher, always wanted her business to be able to encourage creativity in children of all ages, as well as adults, and so soon added extra workshop space to offer pottery painting to both adults and children in the setting of a professional ceramic studio. Today, our ceramics are sold worldwide to a large and enthusiatic group of collectors, and the Pottery Barn the place to be for all creative adults and kids!